HÀ NỘI — Hot weather has caused an increase in patients in hospitals in Hà Nội in the past week due to exhaustion and summer diseases. The Agricultural General Hospital received an average of 1,000 patients per day in the past week, some 30 per cent more than usual, Sức khỏe & Đời sống (Health & Life) newspaper reported. A number of them who carried diseases such as high blood pressure, diabetes and cardiovascular diseases, which were worsened due to the warm weather, were hospitalised to receive treatment. The number of patients increased by 30-50 per cent at Bạch Mai Hospital and the National Geriatric Hospital in the past week due mainly to worsened asthma and chronic obstructive pulmonary diseases, and 20 per cent at the National Hospital of Pediatrics due mainly to high fever, diarrhea, and respiratory diseases. The high heat also killed and stunted the growth of farmed shrimps in the central province of Thừa Thiên-Huế, Nông nghiệp (Agriculture) newspaper reported. In the past 10 days, officials from the province’s Department of Fisheries frequently visited and monitored local shrimp farms in order to minimise risks of shrimp deaths, especially the 400ha that raises them on sand. Farmers were instructed to mix bio-based products with the shrimp’s food to increase resistance and limit the risk of diseases, as well as to regularly perform aeration in shrimp ponds after rain. They were also advised to keep track of pH levels in the water. They were also advised not to start raising new batches of shrimp until August or September when cooler weather arrives. The Central Highland province of Đắk Lắk recently asked the Government for VNĐ52,700,000 (US$2,300) of financial support to fight against droughts, Nông nghiệp newspaper reported. Reports from the province’s authorities show that 260,000ha of crops in the province are in need of watering, but its water supplies for agricultural production and domestic use have been rapidly decreasing. By now low water levels can be observed in many reservoirs and rivers, and many of the province’s irrigation constructions have degraded and are unable to extract water from underground sources. 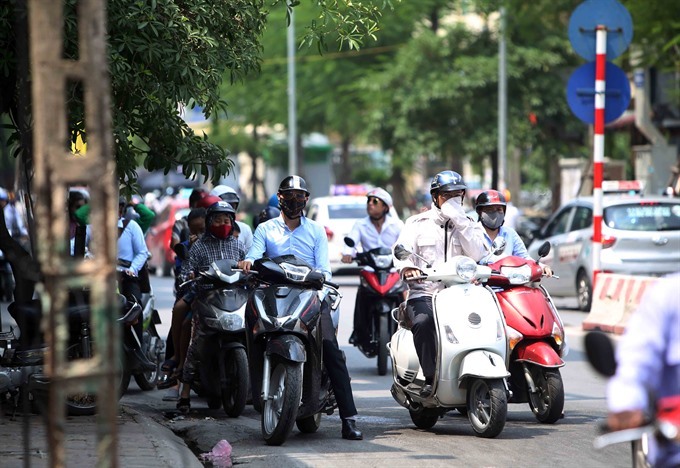 Hundreds of residents in the Mỹ An Ward in the central Đà Nẵng City have been enduring an increase in the number of flies born during the heat wave, Thanh Niên (Young People) newspaper reported. This was partly due to some residents’ growing vegetables with manure and oil cakes without covering the zones, creating a friendly environment for the pests. According to local residents, the problem has been bothering them for the last 15 years, and no solution has yet been implemented. Fly-spraying was conducted several times as the authorities tried to control the outbreak, but it only induced temporary effects.